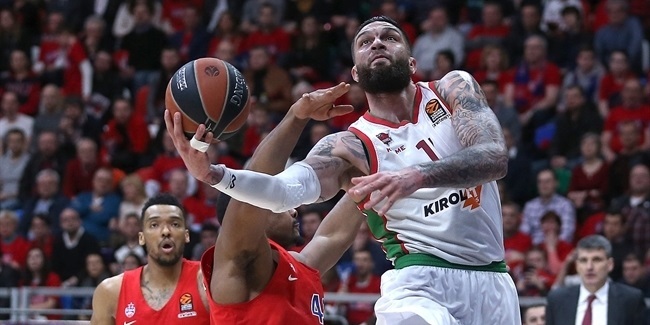 Two-time EuroLeague champion Georgios Printezis of Olympiacos Piraeus rose to the top yet again this week to lead the Reds to a tough victory and to claim MVP honors for Round 22 of the Turkish Airlines EuroLeague Regular Season. Printezis recorded his first double-double of the season in helping Olympiacos beat Zalgiris Kaunas 73-64 at Peace and Friendship Stadium. The veteran forward amassed 17 points and 10 rebounds, which were both game-highs, to compile a performance index rating of 30, which was the highest of the round. He made 4 of 7 two-point shots and 3 of 4 three-pointers in addition to collecting 2 assists and 2 steals to become the first weekly MVP for Olympiacos this season. Another two-time champion narrowly missed what would have been his first weekly MVP as Nikita Kurbanov of CSKA Moscow enjoyed a perfect shooting night in setting a career-high with an index rating of 29 in his team's 102-80 rout of Crvena Zvezda mts Belgrade. Kurbanov made 3 two-pointers, 2 threes and 6 shots from the foul line for 18 points in just 21 minutes. He also contributed 5 rebounds and 3 steals for the champs. Alex Tyus starred in Galatasaray Odeabank Istanbul's 62-69 victory at FC Barcelona Lassa with 19 points, 9 rebounds and 2 blocks for an index rating of 28. 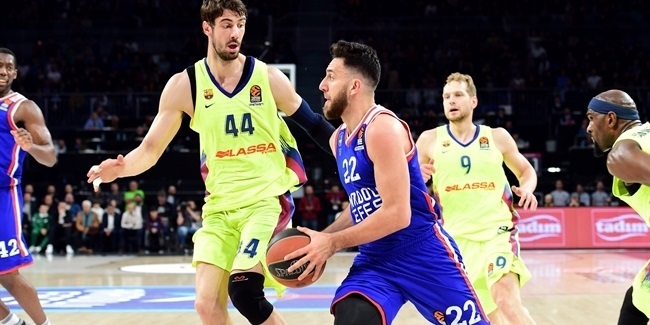 Rounding out the top performances of Round 22 were two big men who posted big numbers on losing sides: Zvezda's Luka Mitrovic scored 16 points and made a career-best 9 assists in Moscow, while Johannes Voigtmann of Baskonia Vitoria Gasteiz posted 13 points and 11 rebounds in an 85-84 loss at Maccabi FOX Tel Aviv. Each recorded a 26 index rating. Reigning MVP Nando De Colo of CSKA, who led the league in scoring last season, topped the Round 22 charts with 25 points. He ranks second this season with 19.5 points per game behind only another former Alphonso Ford Trophy winner, Keith Langford of Unics Kazan, with 22.3 points per game. Barcelona's veteran forward Stratos Perperoglou set a career-high with 12 rebounds, which were more than any other player had in this round. Brose Bamberg forward Nicolo Melli now leads all players with 7.8 rebounds per game for the season. 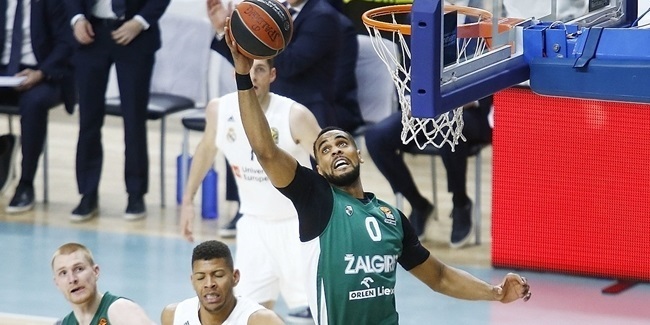 Real Madrid's teenage sensation Luka Doncic and Darussafaka veteran Brad Wanamaker tied for the most assists in Round 22 with 11. CSKA playmaker Milos Teodosic ranks first this season with 7.4 assists per game. Efes playmaker Jayson Granger collected 4 steals, the most in Round 22. Charles Jenkins of Crvena Zvezda mts Belgrade remains the league leader with 2.0 steals per game. Centers Alex Kirk of Efes and Augusto Lima of Zalgiris each rejected 3 shots, which were the high marks for Round 22. Ekpe Udoh of Fenerbahce Istanbul owns the league's best average with 2.1 blocks per game. Four players had double-doubles in Round 22: Printezis, Voigtmann, Ante Zizic (13 points, 10 rebounds) of Darussafaka and his teammate Wanamaker (12 points, 11 assists).